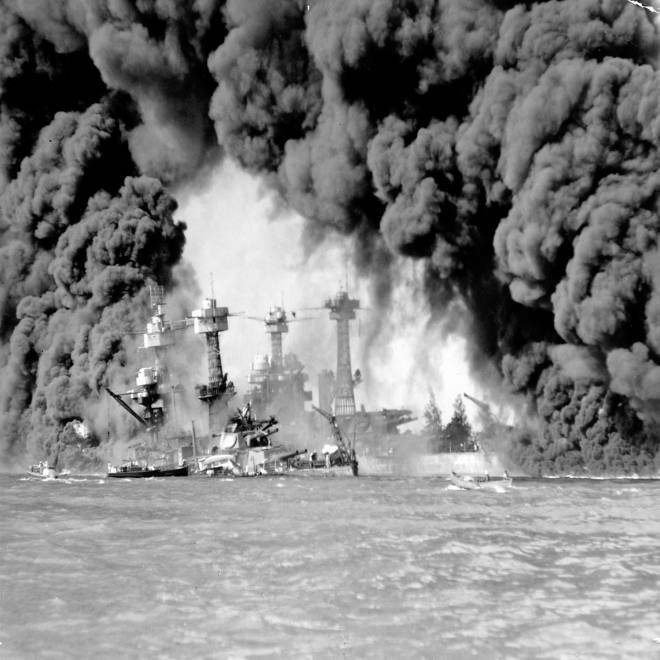 Smoke pours from wrecked American warships after the Japanese surprise attack on Pearl Harbor on Dec. 7, 1941. Updated at 5:54 p.m. ET: More than 2,000 people at Pearl Harbor and many more around the country are marking the 71st anniversary of the Japanese attack that killed thousands of people and launched the United States into World War II. The USS Michael Murphy, a recently christened ship named after a Pearl Harbor-based Navy SEAL killed in Afghanistan, sounded its ship's whistle Friday to start a moment of silence at 7:55 a.m., marking the exact time the bombing began in 1941. Crew members lined the edge of the Navy guided-missile destroyer in the harbor where the USS Arizona and USS Utah, battleships that sank in the attack, still lie. Hawaii Air National Guard F-22 fighter jets flew overhead in a special "missing man" formation to break the silence. "Let us remember that this is where it all began. Let us remember that the arc of history was bent at this place 71 years ago today and a generation of young men and women reached deep and rose up to lead our nation to victory," Rhea Suh, Interior Department assistant secretary, told the crowd. "Let us remember and be forever grateful for all of their sacrifices." About 30 survivors, many using walkers and canes, attended the commemoration. Edwin Schuler, of San Jose, Calif., said he remembered going up to the bridge of his ship, the USS Phoenix, to read a book on a bright, sunny Sunday morning in 1941 when he saw planes dropping bombs. "I thought: 'Whoa, they're using big practice bombs.' I didn't know," said Schuler, 91. Schuler said he's returned for the annual ceremony about 30 times because it's important to spread the message of remembering Pearl Harbor. Ewalt Shatz, 89, said returning to Pearl Harbor "keeps the spirit going, the remembering of what can happen." Shatz, who now lives in Riverside, Calif., was on board the USS Patterson that morning when the alarm sounded. His more experienced shipmates were down below putting a boiler back together so Shatz found himself manning a 50-caliber machine gun for the first time. The Navy credited him with shooting a Japanese plane. "That was some good shooting," said U.S. Pacific Fleet commander Adm. Cecil Haney who recounted Shatz' experience in the keynote address. "Thank you for your courage and tenacity — our nation is truly grateful." Online, Pearl Harbor became a popular topic on Facebook and other social networks, trending worldwide on Twitter and Google Plus as people marked the anniversary with status updates, personal stories of family and photos. Taps are played during a ceremony commemorating the Japanese attack on Pearl Harbor on Friday, at Pearl Harbor, Hawaii. The Navy and National Park Service, which is part of the Interior Department, hosted the ceremonies held in remembrance of the 2,390 service members and 49 civilians killed in the attack. Friday's event gave special recognition to members of the Women Airforce Service Pilots, who flew noncombat missions during World War II, and to Ray Emory, a 91-year-old Pearl Harbor survivor who has pushed to identify the remains of unknown servicemen. The ceremony also includes a Hawaiian blessing, songs played by the U.S. Pacific Fleet band and a rifle salute from the U.S. Marine Corps. President Barack Obama marked the day on Thursday by issuing a presidential proclamation, calling for flags to fly at half-staff on Friday and asking all Americans to observe the day of remembrance and honor military service members and veterans. "Today, we pay solemn tribute to America's sons and daughters who made the ultimate sacrifice at Oahu," Obama said in a statement. "As we do, let us also reaffirm that their legacy will always burn bright — whether in the memory of those who knew them, the spirit of service that guides our men and women in uniform today, or the heart of the country they kept strong and free." Daniel Inouye, Hawaii's senior U.S. senator and a member of an Army unit of Japanese-Americans who volunteered to fight in World War II, said the Pearl Harbor attack evoked anger, fierce patriotism and racism. "Our way of life has always, and will always be, protected and preserved by volunteers willing to give their lives for what we believe in," the Democrat said. The Navy and park service will resume taking visitors to the USS Arizona Memorial, which sits atop the sunken battleship, after the ceremony.